I have to thank my friends Erin, Nicole and Nancy for this post! Ryan and I are in the middle of a 6 weekend-in-a-row traveling frenzy, which has not left much time for cooking and blogging! However, I have received a lot of requests for Thanksgiving sides, desserts and snacks. First of all, I am extremely flattered that people come to me!! I am the first to admit I am not an expert, but I do love to cook. I responded to each with a long list of ideas and recipe recommendations, some from Kettler Cuisine and some from other sites. I thought it might be helpful to combine all of these into a Thanksgiving Recipe Roundup! Especially for those last minute planners that are in need of ideas. I may not be cooking, but I never stop thinking about it! First up, the appetizers. The quintessential beginning of a food-filled day! There is usually one rock-star appy that appears at the Hegele Thanksgiving Extravaganza (and yes, we literally call it that) - Trash! No, I am not talking about the waste-filled bin that stinks up your kitchen, I am talking about the most delicious, addictive, buttery, herby, chex-mix you can imagine. Luckily for you, I have already posted the recipe. Roasted Red Grapes, served over brie or goat cheese with crackers. Fillo shells filled with either Caramelized Fennel and Pancetta or a favorite cheese. Grilled Jalapeno Poppers with Bacon for the Thanksgiving grillers. Caramelized Onion Dip, from 101 Cookbooks - seriously amazing, I promise! Walnut and Roasted Red Pepper Dip (my gluten free version is coming shortly, but for now enjoy Ellie Krieger's). Cranberry Feta Pinwheels are a festive and VERY easy. 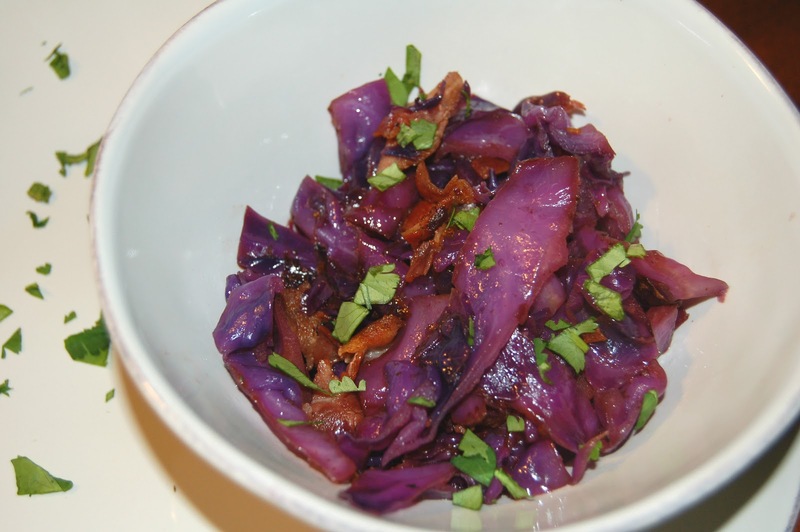 Balsamic Red Cabbage with Bacon, because bacon makes anything taste better! Brussels Sprout Saute is a new take on a old green cabbage. Roasted Garlic! Add this into your plain, boring mashed potatoes. We are pie people, and we don't joke around with our pies! I am working on a pie crust post, since I use it in several recipes on my blog. Until then, you will have to get by with non-pie desserts for the holidays from KettlerCusine. But don't worry, I have listed some killer pumpkin pie options from other blogs a little bit further down. Pumpkin Bars are a great substitute for the non-pie eaters. They NEVER disappoint! Chocolate Cherry Brownies for the chocoholics out there. Warning, chocolate coma ahead! Don't worry, I sneak in some whole wheat. Strawberry Rhubarb Crumble, for those not on the East Coast and actually have access to good produce outside the summer months. Cherry Galette can easily be made with apples or pears instead. Raw Brownies are my personal favorite, not to mention gluten free, dairy free, and good for you. Pumpkin pie is the standard dessert for Thanksgiving, so I had to represent! I have used a recipe from a local bakery called Fosters Market for as long as I can remember. It is my go to pumpkin pie recipe for the holidays, except that I always double the spices and use freshly grated nutmeg instead of already ground. Ironically, pumpkin pie is not the family favorite in the Hegele crew, so I usually end up making my own to bring. I CAN NOT, I repeat, CAN NOT have Thanksgiving without pumpkin pie. This year, I am making two pumpkin pies! My standard and then a dairy free version from 101 Cookbooks. Silky Pumpkin Pie from Fosters Market in North Carolina. Spice-kissed Pumpkin Pie from 101 Cookbooks, which I am literally in the middle of making right now! Paleo Pecan Pie from Deliciously Organic that does not have corn syrup in the recipe. I completely understand if you don't like my suggestions, in which case I hope you can find something from the below links. These are other recipe roundups from various blogs and sites I follow. Most importantly, plan ahead as much as possible so you can enjoy time with your family. Thanksgiving is a time to be with loved ones and be thankful for what you have. I certainly am! Marathon training was very time consuming, and often took away from my passion of cooking. I am glad to say that training is over and the Holidays are among us! I can't wait to dive back into the kitchen and share new recipes with you. Until then, I thought I would share a sandwich I made on one of those long training nights. Towards the end of the training schedule, the runs got further and longer, meaning dinner options had to be quick. Eggs were often my solution for this. They are quick, healthy and very filling. Not to mention, they provide the protein needed to recover muscles after a long run. I dove right in, then remembered I needed to take a picture! 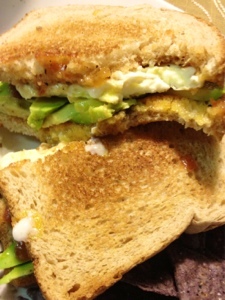 This sandwich was quite enjoyable and inspired by one I recently had in Austin. Toast your favorite bread (gluten or sans gluten), slice ripe avocado, fry two eggs, schmear pepper jelly or favorite condiment on the bread and assemble. I didn't include cheese because I was doing no dairy the weeks before the race, but I bet a slice of Swiss would be delightful on this bad boy! Toast 2 slices of bread and prep all of the condiments and sandwich components for assembly. Heat a medium non-stick skillet over medium heat. Once the pan is hot, melt a little bit of butter in the pan. Crack two eggs into the pan, being careful not to burst the yolk. After about a minute, flip the eggs over gently to fry the other side, again being careful not to disturb the yolk. Cook the egg to desired firmness. I like a runny yolk since I don't use mayo or cheese on my sandwich. 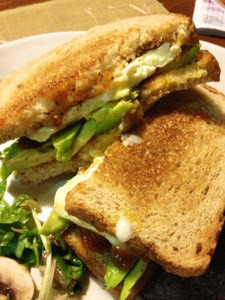 Place the fried eggs, avocado and other sandwich components onto the toasted bread, slice in half and devour! Go crazy and try a new condiment, like Stonewall's Kitchen Roasted Garlic Onion Jam or a Seven Pepper Jelly. Or even, a pesto or olive tapenade. I did it. I ran a marathon! 26.2 miles. The most difficult thing I have done, mentally and physically. How did I do this? I trained very hard, kept a positive attitude and lived by Jimmy V's mentality, "don't give up, don't ever give up." Despite several odds against me, I did it. About three and half years ago, I was diagnosed with Ileitis Crohn's Disease. Crohn's is a form of IBD (Inflammatory Bowel Disease) that is described as a chronic inflammatory condition of the gastrointestinal tract (GI tract). It is considered an autoimmune disease - meaning my immune system attacks the good bacteria in my body causing inflammation, which leads to many symptoms. Symptoms that I suffered through for a better part of a year. I was forced to make a decision, either sit and feel sorry for myself or take action and prove to myself that this disease didn't need to control my life. There was certainly a period where I did feel sorry for myself. I was constantly tired and sick, not wanting to go anywhere, afraid that I would get out and not feel well. It affected the relationships around me. My friends, my family and most significantly, my relationship with Ryan. Don't get me wrong, he was extremely supportive of everything, but there were months where I had no energy after work, couldn't eat anything without feeling sick and I never wanted to go anywhere. I let Crohn's take over my life. My parents - part of my awesome support group! I don't exactly remember the turning point, but at some point I decided there was a better way of living with Crohn's Disease. I started researching inspirational stories of IBD patients that battled their way back into remission. One such story was of a runner and then a friend convinced me to join a Running Start program to train for a 5K. Good friend Dhruv! He got me into running. You can also see all the shadows of our families taking pictures of our accomplishment. The small amounts of exercise slowly started to improve my health and energy levels. I then started playing around with different food combinations, keeping a food journal and cutting back on discovered "trigger" foods. The 5K came and went, then came the half marathon training program. I started a diligent routine, training not only my muscles and lungs, but my stomach as well. It was very important to watch my diet, especially around the longer runs. The half marathon came and went, several of them actually, but what was the next step? I was afraid to go on to a full marathon, scared that my body couldn't handle the intense, long workouts. Scared that I would be thrown back into a flare up from the exertion. The fear didn't last long, someone reminded me that life can be short. I wasn't going to let fear subside me again. The Hubby figuratively and literally holds me up! 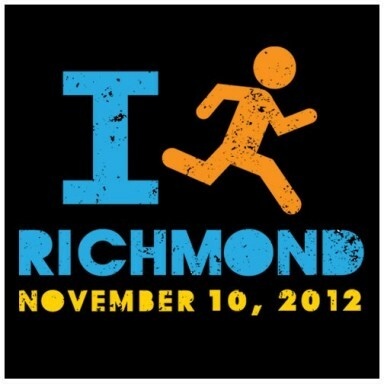 I signed up for the marathon! 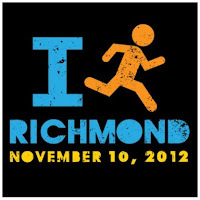 I signed up for 26.2 miles of running…what was I thinking?!?!?! It was tough, REALLY tough. There were moments where I wanted to give up, but I kept going knowing that my family was waiting for me at the end. My training buddies, Shauna and Dhruv. It took me a few years, but I went from a tired, pained, miserable Crohn's patient to a healthy, energetic, optimistic marathon runner! Who would have thought. There are several people out there with conditions, even some in my family. I hope that these conditions don't stop you from doing the things you dream about. I am not telling you to go out and run a marathon, but certainly strive for your own greatness! I leave you with Jim Valvano's inspirational speech from 1993, watch it!! We often forget about all of the brave men and women overseas that are fighting for the freedom that we take for granted. Well, this day will certainly not be forgotten by many in my life. Saturday, we lost a great soldier, one that fought bravely for his country. One that was a wonderful man, loved by many. He was a brother, a son, a friend, a boyfriend, an uncle, but most significantly he was young, too young. He served for his country and paid the ultimate sacrifice. My heart aches for his family. They are in my thoughts and prayers. This tragedy has made me think...a lot. There has been a lot of political banter back and forth about the election. 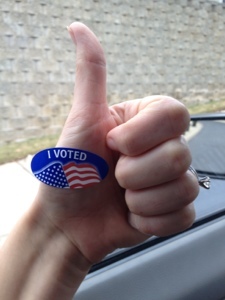 And while I have kept myself out of the middle of it, I will say one thing, I voted today! Regardless of party affiliation or candidate following, just vote! It is important to take interest, no matter what amount, in the issues that affect us. Whether it be tax cuts, healthcare or foreign policy, everyone is affected and should have a stance. I feel this is my duty as an American citizen. This is the service I can give to my country. Leftover night! Our attempt to clean out the fridge before Sunday Fun Day! And yes, Sunday Fun Day is my favorite day of the week, because it usually means going to the Farmer's Market and grocery store, then cooking all day! Oh and not to mention, football! But, I digress. So, we were eating leftovers and I decided to use the remaining fresh spinach for a side salad to accompany the leftover soup (for me) and pasta (for him). I literally did not have any dressing in our fridge, so decided to make my own. A little homemade dressing, a little nuts and dried fruit and this became a "throw together" that turned into a delicious salad, especially for the Fall. We devoured the salad so fast, that I didn't take a picture. So I woke up the next morning and remade it. Ryan is a Ranch-lover, we all know this. I have been on a mission to create (or buy) other dressings that he will equally love. This was one such success. The key for Ryan is to create a creamy texture that mimics the thickness and richness of ranch. However, I am not a fan of the fat content that accompanies ranch dressing. So I improvised a bit. Yes, I do add a little bit of mayonnaise to this dressing, but only in moderation to get the texture. I have to face the fact that Ryan will never stop eating Ranch, but if I can get him to use it less, then I consider that an accomplishment! This is a very easy and quick salad, especially in the fall, when apples are crisp and abundant in most kitchens. For the salad, place spinach on a small plate and equally distribute the apple, walnuts, raisins and cheese among the plates. In a small bowl, whisk together the mayonnaise, vinegar, honey and salt and pepper. Slowly add in the olive oil, while whisking.